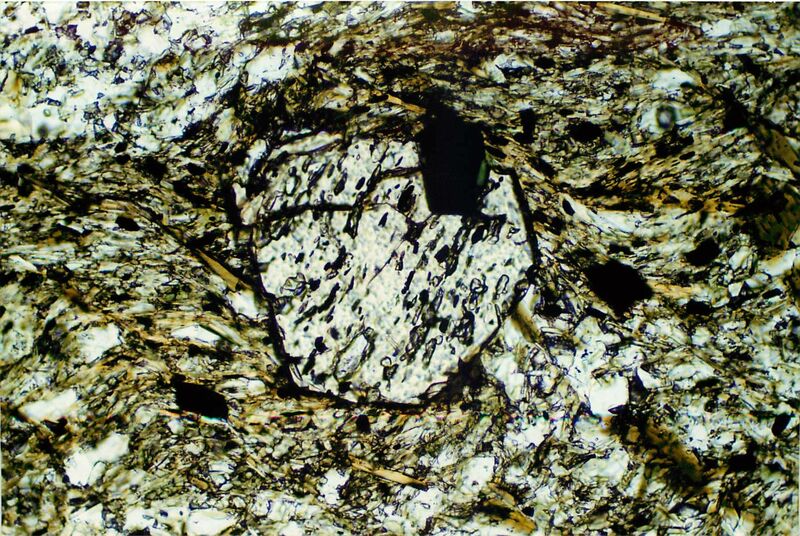 This is the third in my series on how the petrographic microscope is used in geology. First we had the behavior of light, then minerals in PPL. Today’s topic: crossed polars or XPL. 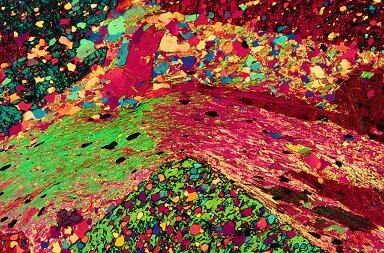 Isotropic minerals are not the most fascinating things to look at in crossed polars, which is why this blog is entitled “Life in Plane Light” and not… “The analyzer is in”? “Light Interference”? “Maximum birefringence”? There are two special cases to consider: when the two light rays are exactly in sync with each other they will add to give the maximum value (“in phase”); when 1/2 a length “out of phase” from each other, they will cancel out each other to give the minimum value. As the crystal is rotated, the orientation of the crystal varies and the light entering will vary in speed, which means that the sum of light will vary as you rotate the stage. There will be two end-members: one oriented perpendicular to the upper polarizer (minimum light) & one parallel to the analyzer (maximum light). The maximum color will depend on the thickness of the crystal (it can vary somewhat depending on how well your thin section is made) as well as what the difference between the refractive indices of the two rays. 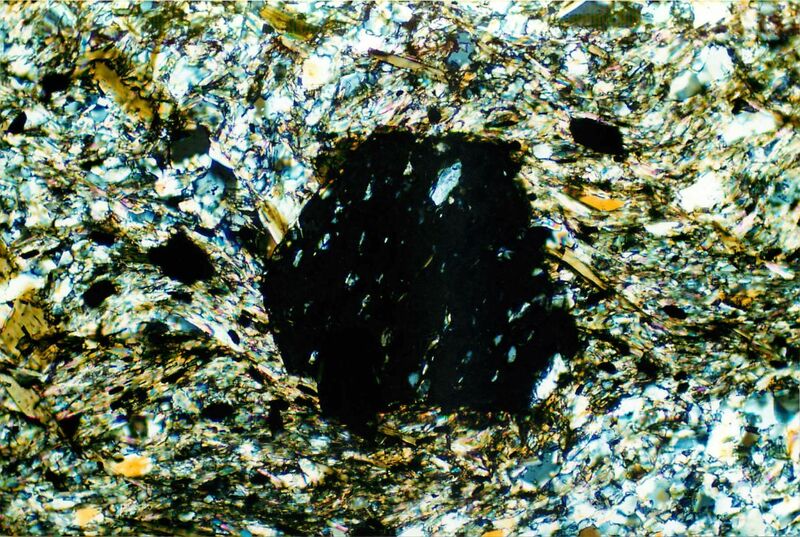 The color we see in crossed polars, is called the “interference color” and is varies through a sequence of ever more pastel sequence of rainbow colors on a “Michel-Levy chart.” If you look at the photomicrograph above, you can see that the non-garnet minerals vary from quartzes & plagioclases that are 1st order greys to white to muscovite & biotite that are 2nd to 3rd order. to find the birefringence, we determine the interference color of the mineral at the maximum light (45 degrees from extinction) and go up to the thickness of the mineral (usually 0.3 mm). Follow the inclined line up to the top or to the right side to read off what the birefringence is. Another property we can specify for elongate minerals is the sign of elongation (stop sniggering). The property depends on whether the fast or slow light ray is parallel to the elongate direction of the crystal. However, to test for this one, we need to use one more component on the microscope: the “quartz wedge” or “accessory plate” or “gypsum plate” or “the psychedelic color thingy” (my students occasionally get creative with their naming). The accessory plate is labeled with the slow vibration direction & the wave length of light that it will add. The vibration direction is usually oriented SW-NE. When the slow ray of the mineral is oriented in the same direction, we get addition and the interference color will increase by whatever the specified wave length is. If the fast direction is NE-SW, the interference color will decrease by the wave length. The last property we’re going to talk about is the more formal pleochroic scheme (we did informal last week). In plane light, the absorbed color of the mineral will vary depending on the orientation of the crystal. In the formal scheme, we assign specific colors to specific orientations. For uniaxial minerals, there are two end-member colors: the “omega” or “w” or “ordinary” direction, which is the only light direction in the circular section; the “epsilon” or “E” or “extraordinary” direction, which is the maximum difference in refractive indices from the ordinary direction & is perpendicular to the circular section (also called the “principal section”). The ordinary direction will always be present when the crystal is oriented with the circular section parallel to the stage (e.g. when the mineral acts isotropicly). 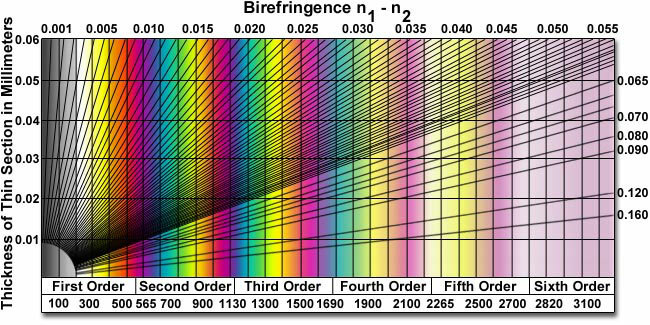 For biaxial minerals, we need to assign three colors: “alpha” or “X” & “beta” or “Y” and “omega” or “Z” which correspond to the smallest, moderate, and largest refractive indices; you can only see a maximum of two of the colors for any given orientation of the mineral, so you’ll need 2 different cuts (circular & principal section) through the mineral to describe the whole pleochroic scheme; beta can be seen in the circular section, while alpha & omega will be found in the principal section (use the accessory plate to determine which one is the alpha = fast and omega = slow directions). Dave Hirsch has some great pleochroism movies on his website. 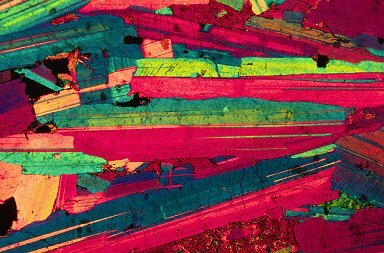 Next week, we’re going to go to structure for a post & discuss Mohr circles, but then we’ll be back to mineralogy & optic axis figures.